Visit Alfa Romeo Fiat of Fort Worth's profile on Pinterest. Alfa Romeo FIAT of Fort Worth is committed to providing outstanding quality customer service. We have made a commitment to the highest quality standards in the automotive industry. It takes going above and beyond all competitors, and focusing, each and every day, on the hundreds of details that add up to an unparalleled automotive ownership experience. We focus on the little things to provide a high quality automotive buying experience to all of our customers because our highest priority is our customer, and we do whatever it takes to exceed their expectations. Alfa Romeo FIAT of Fort Worth allows every customer to post automotive reviews for all consumers to see and make an informed decision about our service and products. We know you have many choices to choose from, and we want to be your automotive dealer for life. Not only will you have the opportunity to post New and Used Car reviews, but you will be able to share how Alfa Romeo FIAT of Fort Worth treated you. We want to know how we did from the moment you were greeted at the door of our dealership, the automotive buying process, how you were treated in finance, until the time you drove your vehicle off of our dealership lot. Customer satisfaction is our job, and we love making our customers happy. Alfa Romeo FIAT of Fort Worth is a top rated New and Used Car dealership in the Fort Worth, Texas Area. Alfa Romeo FIAT of Fort Worth is a member of the Alfa Romeo FIAT of Fort Worth Dealer Group a leader in the automotive business for many years. 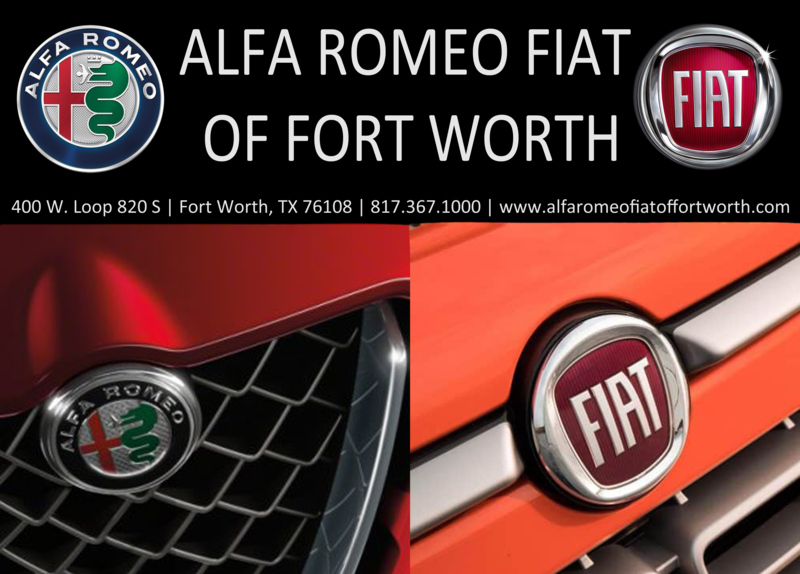 Alfa Romeo FIAT of Fort Worth serves clients in Fort Worth, Texas. We have put thousands of our customers into new or used cars, trucks, and SUV’s. However, it is not just about putting you in the right car, truck, or SUV; it is about where you are going in the best vehicle for your needs. Whether you are in the market to purchase a new or pre-owned vehicle, we'll help you find the financing options that work for you! Even if you have bad credit, or are a first time car buyer, you can trust that Alfa Romeo FIAT of Fort Worth will professionally fit you into the automobile of your choice. Alfa Romeo FIAT of Fort Worth understands you are looking for a strong value, and will find the best price that meets your budget. Located at 400 West Loop 820 S Fort Worth, TX 76108; Alfa Romeo FIAT of Fort Worth professionally managed Service and Parts Departments are open extended hours to accommodate our customers' busy schedules; and, as always, Alfa Romeo FIAT of Fort Worth offers competitive pricing for your automotive maintenance needs. Alfa Romeo FIAT of Fort Worth has highly trained experts to help find the perfect vehicle and keep it in peak. Exceeding expectations is what one will find at Alfa Romeo FIAT of Fort Worth sales, service, and parts departments. Please feel free to contact us at (817) 367-1000 if you have any questions or comments.